Varanasi an auspicious place for more than 2,500 years this city has attracted seekers and pilgrims. Its heart lies between the streams of the Varuna and the Assi which flow into the Ganges and give the city its name. This is the home of the god Shiva, who, to his devotees, is the one great God. To die here in his city on the banks of the holy river is to achieve moksha, liberation from the cycle of life and death. Death is not hidden in India. It is part of life, and one reason why you find cremation grounds in the very centre of Varanasi, and cremation ghats lining the river. It is not uncommon to see muslin-wrapped bodies being carried through town and down to the river, placed on a funeral pyre and cremated in full public view. This unlimited access to the practical applications of the Hindu faith, the raw intimacy with death and the stifling intensity of the narrow lanes that lead down to the holy river often combine to leave visitors literally breathless, emotionally overcome but never unmoved, or unimpressed. Perhaps nowhere else in India can offer the visitor such an explicit crash course in the tenets of Hinduism; a visit to Varanasi goes a long way in helping to explain sights and sounds you might encounter elsewhere in India. Situated on the western bank of holy River Ganga, Kashi Vishwanath Temple is regarded as one of the most popular Hindu temples dedicated to Lord Shiva. Located in the heart of Varanasi, the temple is a core of faith for millions of Hindus. As per the Shaiva philosophy, it is believed that the Kashi Vishwanath temple is the centre of the worship since a long time. The the main deity of Kashi Vishwanath Temple is Lord Shiva, also known as Vishwanatha or Vishweshwarar meaning 'the ruler of the universe'. 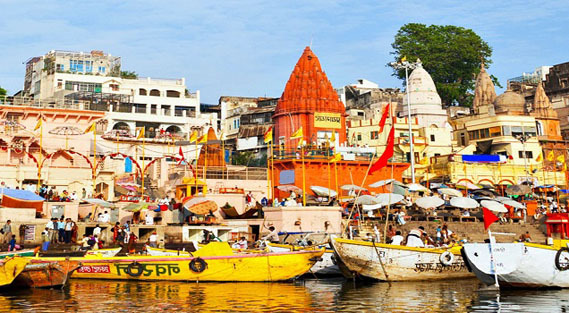 The city of Varanasi, the cultural capital of India, is thus known as the city of Lord Shiva. The presiding Jyotirlinga in the temple is considered as the 12th of all the Jyotirlingas in the country. In the olden times, on special festivals such as Shivaratri, the king of Kashi (Kashi Naresh) visited the temple for worship during which nobody else is allowed to enter the temple premises. Devotees were allowed only after the king had concluded his prayers. Being one of the most famous temples of Varanasi, the temple witnesses around 3,000 devotees on daily basis and the footfall increases to 1,00,000 on special occasions. The importance of the Kashi Vishwanath Temple also stems from the fact that it finds mentions in several holy scriptures of the Hindus. On the outside, the temple is adorned with intricate carvings that impart a divine quality to the facade. There is also a well present within the temple complex called Jnana Vapi or wisdom well. Other than that, the temple also houses several other small temples such as Kaalbhairav, Vishnu, Virupaksh Gauri, Vinayaka and Avimukteshwara. As the name suggests, it is believed that this is the place where Lord Brahma performed the Dasa Ashwamedha sacrifice. This ghat is a religious spot and many rituals are performed here. Visit at the time of Kartik Purnima to witness a celestial manifestation in the city of lights - Dev Deepavali. This Ghat is most famous for the Ganga Aarti conducted every evening, and hundreds of people visit it every day. Watching the Ganga Aarti is an experience which cannot be explained in words. When in Varanasi, make sure not to miss this calming experience. The Sankat Mochan Hanuman Temple is situated by the River Assi and was built in the 1900s by the freedom fighter Pandit Madan Mohan Malviya. It is dedicated to Lord Rama and Hanuman. Varanasi is always related to Sankat Mochan Temple and is an essential part of this holy city. Every person visiting Varanasi visits this temple and pay their respects to Hanuman. The laddoo offered at this temple is essentially famous among the locals.While visiting Sankat Mochan be aware of the monkeys who throng the temple premises and tend to steal away the prasad. However, they are totally harmless if you let them be on their own. Constructed in 1964, this temple is dedicated to Lord Rama and is named after the saint poet Tulsi Das. It displays the Shikhara style of architecture and exhibits various inscriptions from the Ram Charit Manas on the walls of the temple. Various episodes of Ramayana have also been depicted on the upper storey of the temple in the form of carvings. The temple is a must visit during the months of Saawan (July - August) when it opens up a special display of puppets, related to Ramayana, and is a fun experience for everyone. The New Vishwanath Temple is every pious man's go-to destination to feel overwhelmed by the presence and power of the great Lord Shiva. Not only is it located in the heart of the cultural capital of India - Varanasi, but its divinity is multiplied by the holy river Ganga that flows by its side. Banaras Hindu University is hence home to one of the biggest tourist attractions in the city of Varanasi, the grand New Vishwanath Temple. Visiting this temple gives the worshipper the space to put himself in the hands of God, at his disposition, and listen to the voice in his heart. The peace and calm of the temple help you forget the distractions of daily life. The positive aura in the air compels one to surrender himself in the gentle caress of the Almighty. The very famous Jyotirlinga of Shiva, Vishweshwara, is believed to have immense and unending power. A single glance of this Jyotirlinga has the ability to cleanse our soul and set us on the true path of knowledge and devotion. Although primarily a Lord Shiva temple, this beautiful temple consists of nine other temples within one and invites people of every faith to bask in its grandeur; using symbolism to express the ideas and beliefs of Hinduism. The New Vishwanath Temple incorporates every element of the Hindu cosmos- the good, the evil and the human; thus implying the major role that Dharma, Kama, Artha, Moksa and Karma play in our life. Durga Mandir , also known as Durga Kund Mandir, Durga Temple and also monkey temple, is one of the most famous temples in the holy city of Varanasi. This temple has great religious importance in Hinduism and is dedicated to the Maa Durga. Durga Mandir was constructed in 18th century by Bengali Maharani. The temple is dedicated to the Goddess Durga. Next to the temple, is a kund (pond) which was earlier connected to the river Ganges. It is believed that the existing icon of the goddess was not made by a man but appeared on its own in the temple. Manikarnika Ghat is one of the holiest among the sacred riverfronts (ghats), alongside the river Ganga. It is believed that a dead human's soul finds salvation (moksha), when cremated here. Thus, scores of the elderly across the whole country seek to walk up to its edges, and spend their last days absorbing the charisma of the ghat - which makes even death painless and insignificant to be pondered upon. One of the oldest temples in the city, Nepali Temple is a 19th century shrine dedicated to Lord Shiva. It was established by the King of Nepal and is a spitting image of the Pashupatinath Temple located in Kathmandu. The traditional architecture of the structure made of stone, terracotta and wood carvings attracts visitors in large numbers. Kedar Ghat, situated in the southern part of the destination, was built by the Maharaja of Vijayanagar. The ghat is named after Lord Shiva, who is also known as ‘Kedarnath'. Popular among Bengali and South Indians, the ghat has a beautiful temple, which is dedicated to Lord Shiva, the presiding deity of the city. This temple is constructed in ancient Hindu architectural style. Located on the banks of river Ganges, Kedar Ghat is one of the famous pilgrimage places in the city of Varanasi visited by numerous saints and pilgrims. Near the Kedar Ghat, there is a Parvati Kund, which is a beautiful pond and is believed to have water with high medicinal properties. Established by Madan Mohan Malviya in 1916, Banaras Hindu University is a 5.3 square kilometre campus in the city. It has about 30,000 students residing in the campus and is the largest residential university in the continent. The University has a long list of notable alumni and faculty. The Indo-Gothic architecture and the sprawling lawns add to the beauty of the place. Famous for being a place of worship for Aghoris and Tantriks, Batuk Bhairav Mandir is considered to be of immense religious importance. The temple is dedicated to Batuk Bhairav who was an incarnation of Lord Shiva. An interesting feature of the temple is the sacred Akhand Deep which is believed to be burning for ages. The oil from this lamp is said to have healing powers. Bharat Mata Mandir is a unique shrine dedicated to our country, Mother India. The temple does not have any deity, but a relief map of the country carved in marble. The temple was the brainchild of Babu Shiv Prasad Gupta, a freedom fighter. It was built in 1936 and inaugurated by Mahatma Gandhi and has ever since been the only one dedicated to a country in the World. Alamgir Mosque, also known as, Beni Madhav Ka Darera, was constructed by the Mughal Emperor, Aurangazeb. It is believed that there was once a temple of Lord Krishna at the site where Alamgir Mosque is situated. Being the largest structure located on the banks of river Ganges, the mosque was constructed during the invasions of Mughals in India. Possessing an imposing construction, the architecture of this structure features a blend of Hindu and Persian styles. Standing on the carved pillars, turrets and beautiful domes, the mosque is frequented by devotees and tourists while visiting the Panchganga Ghat. The lower part of the mosque has a Hindu temple and the design of the whole structure presents rich artworks of ancient India. Man Mandir Ghat, constructed in the 16th century, was built by Raja Savai Man Singh. Earlier known as Someswara Ghat, the Man Mandir Ghat is named after Raja Savai Man Singh. The ghat was renovated in 19th century and houses a beautiful balcony located at the northern end of the ghat. The ghat is dotted with many temples including Rameshwara Temple, Sthuladanta Vinayaka and Someswara temples. Someswara Temple is the exact replica of the Someswara lingam in Somanath of Gujarat. Moreover, the ghat also offers a view of a small observatory, which was constructed by Raja Jai Singh of Jaipur. Shivala Ghat was constructed by one of the most significant rulers of medieval period, King Balwant Singh. The name of the ghat is derived from the presiding deity of region, Lord Shiva. Located in close vicinity is a huge mansion, which was built by king of Nepal, Sanjay Vikram Shah in 19th century. Apart from these, a Shiva Temple and a Brahmendra Math are the other prominent attractions of the ghat. Brahmendra Math, a spiritual centre, was constructed by Kashiraj. An archaeological and art museum, Bharat Kala Bhavan Museum exhibits a beautiful collection of sculptures, artefacts, paintings, jewellery, pottery, textiles, etc. ranging between the 1st and the 15th century. The total artefacts on display are over 100,000 including their rare collection of miniature paintings and manuscripts. Ramnagar Fort attracts tourists from all over, which is situated on the opposite bank of river Ganges. Constructed in 18th century by Maharaja Balwant Singh, it is the ancestral home of the Maharaja of Banaras. The fort is built with red sandstone and houses a temple and a museum within the premises The temple is dedicated to Ved Vyasa, the author of the Indian epic the Mahabharata. As per the legends, it is believed that Ved Vyasa resided within the fort for a short period. The royal family of Banaras is also known as Maharaja of Kashi. At present, this fort continues to be the residential palace of the royal family of Varanasi. Durbar Hall also known as the hall of public audience is the most prominent attraction of the fort. Constructed with marble stones and glossy stones, the fort features Indian as well as Islamic styles of architecture. The carved balconies, open courtyards and beautiful pavilions are the highlights of the fort. Owing to its rich cultural heritage, the fort has emerged as a prominent shooting destination for numerous Indian film makers. Ramnagar Fort also houses the Durga Temple, temple of Dakshin Mukhi Hanuman and Chhinnamastika Temple. Apart from this, the main attraction of the fort is a big clock, which not only displays time, day, week, month and year but also provides accurate astronomical facts. Gyan Vapi Well is a sacred well for the Hindu community located inside the premise of Kashi Vishwanath Temple. The water of the well was considered to be holier than the water of River Ganga before it was polluted by the offerings made by the pilgrims. It is said that when Aurangzeb attacked the old temple, the temple priest threw the Shivalinga in the well and jumped in it to protect it. Chunar Fort is one of the historic testimonies of the destination, which is believed to have been constructed by Maharaja Vikramaditya, King of Ujjain. The historic fort is situated at a distance of 45 km from Mirzapur. This fort was an important post of Mughal king, Babar during bygone years. Later, the fort also served Sher Shah Suri and Akbar. The fort was captured by East India Company in 1772. The ancient fort is famous for Sonwa Mandap, Bhartihari’s Samadhi and Vithalnathji’s Birthplace. Vishwanath Gali is famous for street shopping in Varanasi. A variety of items are sold in the bustling gali at affordable rates. One can easily find modern or traditional apparel, household items, home decor items, brass idols of deities, etc. The Gali is also well known for local snacks and sweets. Chinese Temple is a colourful shrine dedicated to Lord Buddha and built according to the Chinese/Buddhist architecture. The temple has a spacious meditation hall where visitors can meditate in silence and soak in the serene vibe. St. Maryês Church is a 200-year-old architectural marvel, the oldest church in the town and the oldest standing garrison church in the southern part of Asia. It was established in 1810 by Reverend George Weatly and was an important church for the European and British community residing in Varanasi. ISKCON was established by Bhaktivedanta Swami Prabhupada to promote Krishna Consciousness and educate people with the teachings of Lord Krishna as per the Bhagwad Geeta. Regular poojas, kirtanas and chanting sessions are very popular here. Everyone is welcome to join these sessions without discrimination. Ganga Aarti is an important ritual held on a grand scale every morning and evening on the banks of the holy Ganges. The priests perform the Aarti at Dashashwamedh Ghat. The entire Ghat gets illuminated with a divine light that can be felt strongly. The magnificent ritual involves huge brass lamps lit with oil and the priests chant the holy mantras that reverberate in the entire location.